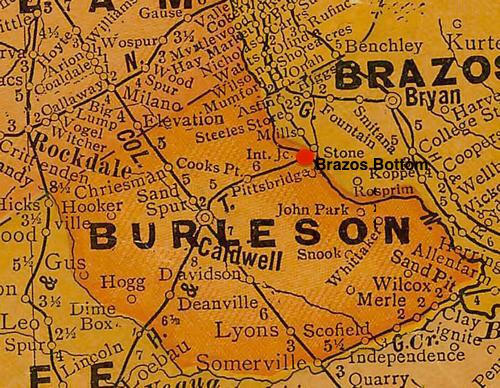 The broad alluvial valley along the eastern border of Burleson County is generally called "The Bottoms." It covers nearly 25% of Burleson County. The Bottoms usually refers to the land between the Brazos and Little Brazos Rivers. This is estimated to be 150,000 acres of very fertile land. Denizens of the area might be surprised that there once was a specific place called Brazos Bottom, Texas. 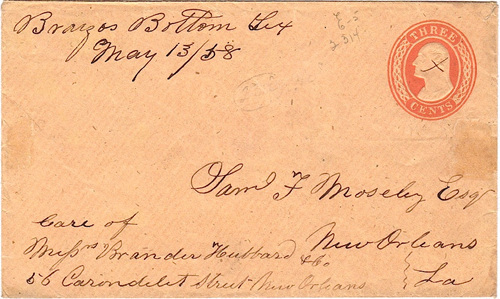 The post office was in the store of the Wilkerson Plantation as attested to by this 1858 postal cover, provided by John Germann. In June of 1899, the Brazos River overflowed its banks, completely submerging flood gauges at Hearne where the waters crested. An estimated 12,000 acres were flooded and nearly 300 people lost their lives in the deluge. During WWII, German soldiers from Camp Hearne were sometimes leased out to area farmers to tend and harvest local crops. Native Son, musician Mance Lipscomb was born in 1895 in the Brazos Bottoms (near Navasota in neighboring Brazos County). The book The Word on the Brazos is a collection of stories about the region, told to the author. Along the lines of the work of Jesse Stewart, the stories are extremely revealing of time and place. Some of them are unforgettable, The book is highly recommended for anyone interested in local history or African-American studies. In one story, the new preacher of a Navasota church is becoming acquainted with his new community. He sees a group of young men, smoking, cursing and gambling. He politely asks them for directions to the post office, which they soon give him. He thanks them and goes on his way. As an afterthought, he goes back to the group and introduces himself, saying he would like to show them "the way to heaven." One of the boys says "How are you going to show us the way to heaven when you don't even know the way to the post office?"